As one of Houston’s Top Gold Buyers, we want our consumers to be well informed to make the best financial decisions when selling their gold. Your prized possessions that are now outdated, broken, or are unable to be passed down to younger generations can generate extra money in your pocket. 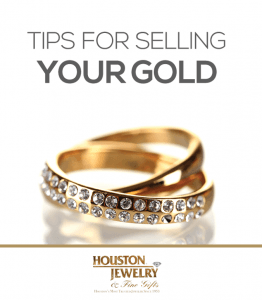 Whether you are selling Gold, Platinum, Sterling Silver or your loose diamonds, Houston Jewelry is the perfect place to go. 1. Prices are calculated based on current market value. This value can fluctuate daily, as well as hourly. When selling your items it is advised to check the current market prices before you come in to sell your items. 2. The metal content and weight of your items are considered in the price. It is imperative that when selling your items you go to a location that has the proper equipment to evaluate both of these factors. 3. If your items include diamonds or precious stones, there is a chance your items will be more valuable, this also applies to pieces that may be considered categorically vintage, designer, or collectible. 4. It is important to find a buyer who can test your metal. At Houston Jewelry, we use an instrument called a Spectrometer. This instrument can tell us the exact metal content and karat of your pieces. 5. It is important to go to a buyer who follows the guidelines and laws of their respective city, state, and all Federal regulations. 6. Take into consideration that most establishments will purchase your items with the intent of melting it down. If your item is sentimental you should reconsider selling it as once it is melted you will not be able to get it back. 7. Although your item may seem worth an enormous amount to you, it is essential that as the consumer you understand you will not be offered retail value in most scenarios. 8. We encourage consumers to visit more than one gold buyer when considering selling their metals. This will ensure that you are getting the best price for your items. 9. When selling your items you may want to inquire ahead of time the method of payment you will receive for your metals. Some people pay cash, while others strictly issue checks. 10. The law requires that you will need identification to sell you items, and it is advised that if you have paperwork, certificates, or receipts for your items you should bring them to the transaction as this information may increase the final price.